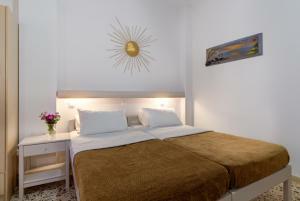 Studios Kamarela is just 50 meters from the black sand beach of Kamari. It offers rooms and independent studios with a private balcony, garden with outdoor furniture and free Wi-Fi in all areas. Guests are kindly requested to inform Kamarela Studios of their expected arrival time in advance. You can use the special requests section of the reservation form or contact the establishment. Room located at 50 meters from Kamari Beach, equipped with air conditioning, small fridge, TV, balcony with garden views and free Wi-Fi. Spacious room located at 50 meters from the beach of Kamari, equipped with air conditioning, mini fridge, TV, balcony and free Wi-Fi. Studio located at 50 meters from the beach of Kamari, equipped with air conditioning, full kitchenette, TV, balcony with garden views and free Wi-Fi. Self-catered studio with kitchenette and balcony with view of the garden.